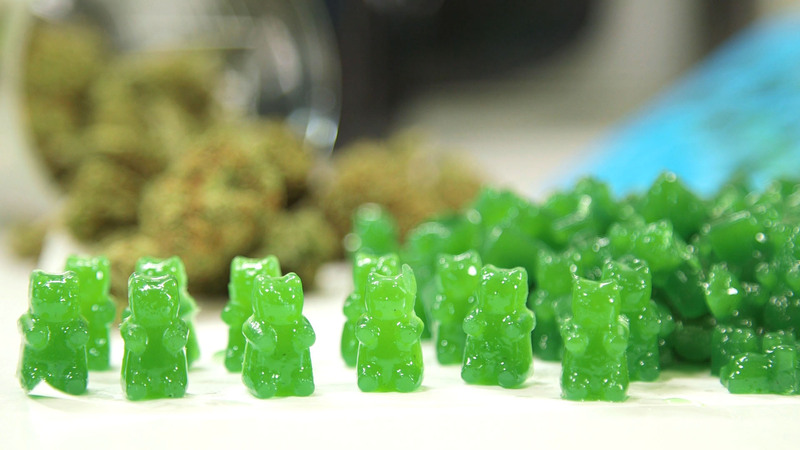 This very popular Cannabis Gummies recipe from RuffHouse Studios using marijuana Infused Coconut Oil will do the trick! 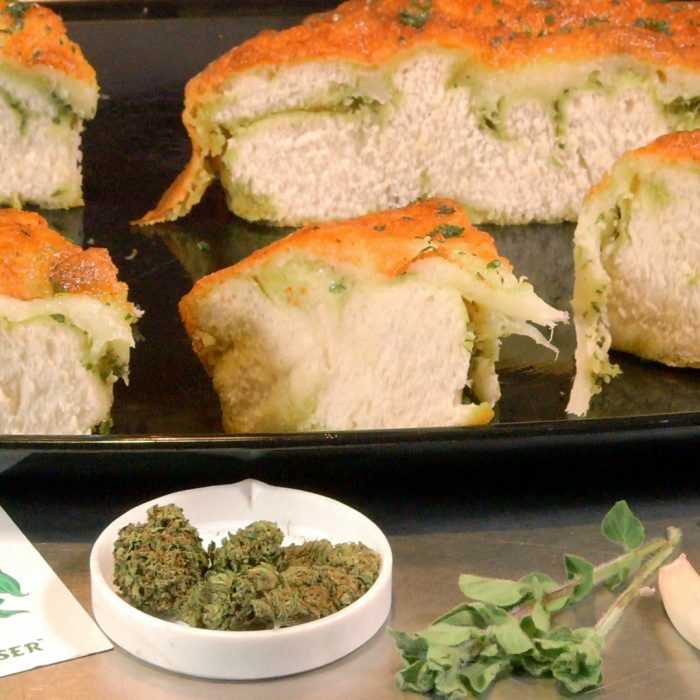 Grind, manicure and decarboxylate cannabis in an oven safe dish in an oven preheated to 250° F for 25 minutes. Remove the oil from oven and let cool for a couple minutes then strain the oil through a fine mesh strainer or filter. Press the oil out of the cannabis. Measure out ¼ cup for the recipe. In a small saucepan over medium heat combine the water and the infused oil and whisk together as you bring it to a boil. Whisk in each container of the unflavored gelatin one at a time while continuing to whisk. Whisk in the flavored gelatin and keep stirring for about 5 minutes and bring to a rolling boil. Reduce heat to low, spray molds with cooking spray. Fill each mold to the top with a dropper or spoon. Keep stirring your mix periodically. Place molds in freezer for 20 minutes or fridge for an hour to firm up. Unmold the candies to enjoy right away or store in airtight containers for 2 – 3 days at room temperature. Freeze for extended storage. No, you should be fine just keep it barely boiling for a few minutes, not too long, not too hot. Where is the original recipe? This isnt it, it’s missing ingredients so its inaccurate. For some reason the full recipe disappeared off ruffhouse site this week and the link on your tube goes to this page. What happened? Sorry for the error, I updated the ingredients list and the directions. This site is for recipes specifically so I am putting all the recipes here to be better found and displayed in Google searches. Made some mistakes when inputting the data from other site. Do you need the rosin chips? No, you can use them if that’s all you have. The ingredients lists the directions for the rosin chips in parentheses after it is mentioned. How much if only using bud ..7 grams be flower be sufficient? Yes, if the weed is good should be nice and strong with 7G. Hell, I use 28g of high quality flower every time (indica if i can get my hands on and confirm it), with 3/4 cup of coconut oil, after infusion im left with 1/2 cup of infused oil. If i were to use only 7 grams of flower or bud, how strong would each bear be? It’s hard to answer that without knowing the THC content of the bud and size of the gummies but here is a general idea. 7G X 20% THC = 1,400 MG available. Now let’s say you have 50 gummies. This is assuming you extract 100% of the THC in the extraction which is unlikely. You probably get 75% of the THC with this type of coconut oil extraction at best. It ALL depends of course on the potency of the oil but the only way to know for sure is to test the oil, each and every batch. Hope this is helpful. So can I substitute the coconut oil for vodka? 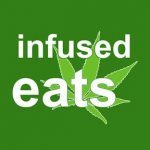 I’ve seen other videos making cannabis infused vodka, just wondering if the gummies for turn out right? I personally would find a different recipe, one using tenture method. I have infused coconut oil already decarbed, for 1t=10mg. Should I add some to reg oil ? If you use ALL 1/4 cup with the infused oil you have already the entire batch will only be 120 mg, you should be fine. Was wondering if it is possible to use 3,5gs of bud & not use the Sunflower/Soy Lecithin? E.g could I halve the ingredients and still get some good quality bears? Why do they only keep a few days in frozen? It said they stay good for only a few days in an airtight container at room temperature. For extended storage to put them in the freeze. In the video you yielded three 50 count trays, plus extra. You also said that 3 or 4 of these is a serving. Based on the recipe for one box of Jello and 1oz of gelatin you said that it’s for 12 servings, which would be 12×4=48 gummy’s. So how did you come out with three times that amount? How long do these keep? I’m looking for something to keep around the house without worrying about them going bad like brownies or other baked goods. This recipe was easy, straightforward, and delicious! On my second batch, I put the mixture into a squeeze bottle to distribute over the molds. This ended up being a lot faster and made way less mess than the dropper method. When I make chocolate I put a 4 cup glass measuring cup in pot of water as double boiler. Good for measurement and easy to pour molds with measuring cup. Mine came out super thick & hard…Did I not let it come to a roaring boil long enough? How much in weight do you use of flavoured jello ? Is a 6 oz pack 6 oz of flavours Jell-O powder ? 1/8oz converts to 3.544grams, but I see someone asked about using 7g (if just using flower and not rosin chips as well). Would you recommend using 7g or should it be sufficient with just the 3.544g as the recipe states? Also if just using flower should we still use the 1/2c of coconut oil as you stated in the video (because of evaporation) or should we just stick with the 1/4c? I’ve ordered the Mighty Fast herbal Infuser, for science. Are the 1/4 cup of tincture are the same (2 hours coconut oil vs 2-5 days alcohol tincture)? I’m lost. Would you make a tutorial to explain the differences between tinctures (oil and alcohol) and what are the benefits/advantages. I have made this recipe but it is sticky before I even can get it into the molds? What can I do to fix it? Also can I substitute canna butter for the oil? 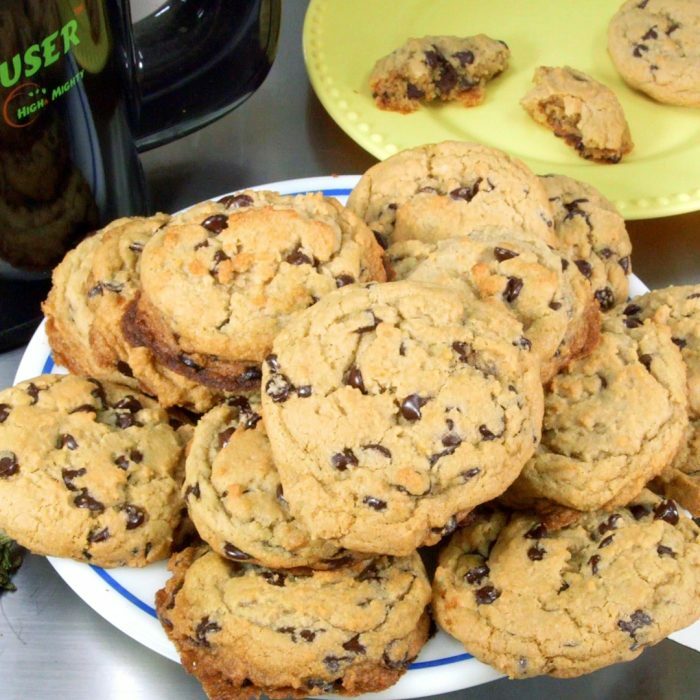 How strong is the smell while baking ? And Making the bears ? Love this! Definitely going to give it a try! With regards to the lecithin; I can’t find the liquid, only granules. Will this work? If yes, how much should I add? If you use powdered lecithin you only need 2/3rds the amount of liquid lecithin. For example if the recipe calls for 3 teaspoons of liquid lecithin you could use 2 teaspoons of powder instead. Lecithin increases bioavailability of the cannabinoids and helps bind water and fat together. In this recipe it’s binding the coconut oil to the water. 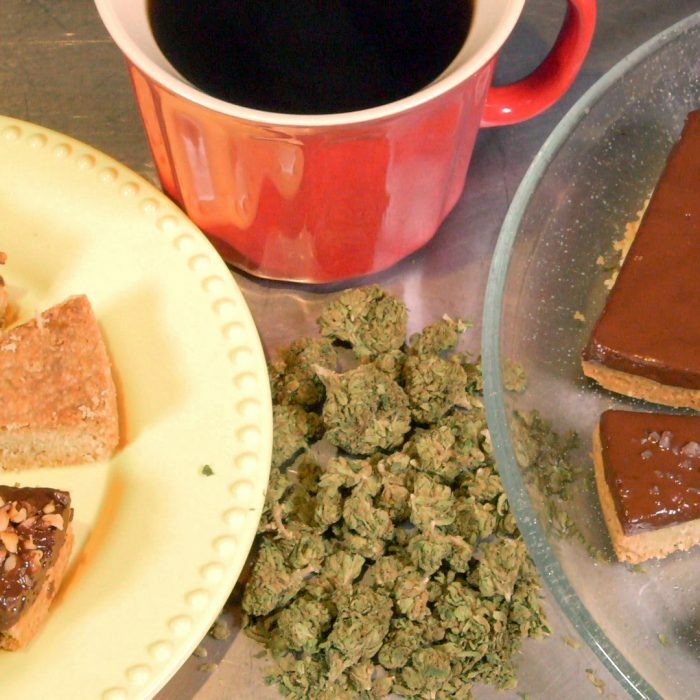 Is this recipe calling 1/8 oz of cannabis flower and the rosin chips? I only have cannabis flower will that work? Could I used orange juice instead of water? As long as you use lecithin to bind the coconut oil you can prepare gelatin any way your confident in doing so. I bought CBD oil from Amazon would this work in this recipe? Replacing some steps and adding 1/4 cup of this to the recipe, good? As long as it’s coconut oil based. Liquid coconut will bind with the lecithin as well as solid coconut oil. Im allergic to coconut oil… id there an alternative oil I can infuse to make this recipe? Cannabutter will impart a buttery flavor. Coconut oil is used because it doesn’t really have its own flavor. In my experience as long as you have the lecithin to bind the fat and water together it works. Your mileage may vary. I find that unrefined coconut oil has an intense flavor I have trouble masking. I am going to try refined coconut oil to see if there it imparts less coconut flavor. We’re cooking it from France ! So with this recipe, how many bears would be a solid amount to be high? 1) The coconut oil didn’t reduce from 1/2 cup to 1/4 cup so I had to leave 1/2 of it sit for another time. This means I lost 50% potency and has me wondering what went wrong. My stove’s temperature could be incorrect, but it’s a pretty new appliance and other than that I followed the directions. I also make firecrackers all the time and have had no issues de-carbing at 250° with the same oven thus far. 2) The recipe calls for “1 pack 6 oz Jello (any flavor)”. Jello packs are only 3 oz though. So I used (2) to get to 6oz, but I feel like that was wayyyyyyy too much. I struggled filling two bear trays before the mixture got so thick it wouldn’t draw up into the baster any more. So I had to just pour it out on a flat surface. Add to that they are tough to eat, extremely chewy. Seems like other people are having a similar issue–makes me wonder if the recipe has a type and it should only be 1 pack 3 oz Jello. Would it be too strong if i used 28 grams with the coconut oil?